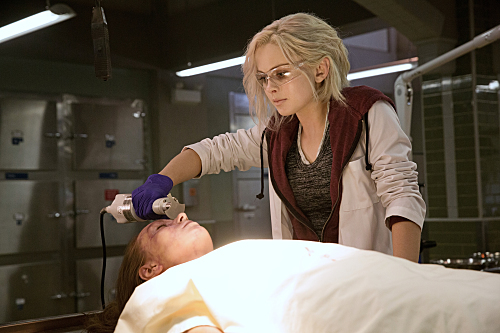 iZombie Review - TV Review - A Zombie Show With Brains. Really. - Are You Screening? iZombie Review – TV Review – A Zombie Show With Brains. Really. When a new series comes along that boasts being from the creators of Veronica Mars (among other things it boasts about), that will pull in audiences, but it also sets itself up for a difficult time living up to expectations. iZombie, the new… criminal investigation meets, well, zombies… show from the CW has a lot to recommend, even just in the theory, but it has to really wow to deliver on the hopes of those who are going to bother to tune in for something called iZombie, and it does. Rose McIver stars as Liv Moore (ha), a type-A medical student who finds herself turned into a zombie at a boat-party gone wrong. Without a lot of options for procuring brains, she takes a job at the city morgue. Her boss, Dr. Ravi Chakrabarti (Rahul Kohli), has caught on, and finally catches her in the act of brain consumption, but he doesn’t want anything more than to study her condition. It turns out that eating brains has certain side effects. Liv discovers that she learns languages and skills from those who donate their brains, and she gets flashes of what happened to them before they died. When murder victims show up, Liv feels that she needs to go to the police, which leads to a continuing relationship with Clive Babineaux (Malcolm Goodwin), who thinks Liv is psychic, and doesn’t ask too many questions, as long as it helps him close cases. We get all of this in the first twenty minutes of the pilot, and it may well be the best opening of a pilot you’re ever going to see. It not only establishes the complexities already mentioned, but lays out Liv, and her family’s unhappiness at her recent decisions, including leaving her fiancee, with the sort of finesse that is usually reserved for efforts with far loftier goals. photo- Cate Cameron/The CW –© 2015 The CW Network, LLC. All rights reserved. Besides the pure storytelling ability, and fun, the show manages a sense of purpose and overall style that is oddly reminiscent of not only its own comic book origins, but comics generally. This is hard to explain frankly, but there is a seriousness, and lack of urgency, about the show that just feels like reading a comic. Whatever murder might have taken place, or danger we might be in, staring at the character is more interesting to a comic than anything else. Plus, as witnessed in episodes following the pilot, Liv relays lessons you never realized she was getting in a way that screams of the final few images in almost every comic. The show obviously needs McIver to be a charismatic force to work at all, and she’s better than anyone in charge of the show could have dared to hope. By the time you get halfway into the second episode, it’s almost as if you start remembering things she did seven or eight episodes ago, because that’s just the sort of weird “long lost friend” persona she delivers. She needs Liv to be the person who gets a Doctor to offer her brains like it’s no big deal… because, obviously… and she does. Acting schools have a list of impossible things to pull off, and that’s one of them. The supporting cast delivers better than you’d expect as well, and certainly far better than they’ll ever get credit for. Goodwin and Kohli have to play characters that are somewhat familiar stock in the comic game, but they add some zing to the equation. Robert Buckly, who plays Liv’s ex-fiancee, Major Lilywhite (because that’s hilarious), hasn’t had a chance to get rolling in the first few episodes, but he put down some foundation by the end of the second. Where things have the potential to fall apart is in the, one must guess, ever-increasing inclusion of David Anders as the “bad guy zombie” Blaine. It isn’t that Anders can’t pull it off, but that it is unclear how the role is going to play out, and how that is going to monkey with the system we’ve created. Overall, the show makes it tricky to get a picture to coalesce, except insofar as conceptually-limited applause substitutes, like that it’s awesome. As I hinted, it pulls off one of the neatest tricks in television, which is to make you somehow think you’ve been watching it longer than you have (Remember when Liv first started med school? Wait, what?). That odd sense of comfort could easily be a positive or negative, depending on your leanings, but it’s impressive. It’s also a show that is wickedly clever just in its aim at constructing a kind of comic book consciousness to exist in. In comics, there’s no leeway for characters who say, or think, stupid things. There’s no glossing over a few dumb lines that move the plot along. In this way, the show feels a lot like it takes notes on its sensibilities from things like Orphan Black, Being Human, and even Lost Girl, in an effort to put forward characters who are real (and generationally relevant), as opposed to those simply born from the genre/situation stockpile. If even part of a show’s rating is how well it delivers on the idea and potential, it’s hard to avoid a perfect score. It couldn’t have been done any better.